How do I place an order for custom cut lumber? Simply complete the form on the Contact Us page, and we will get back to you with pricing and a lead time! Be sure to include the type of material and exact measurements for your custom cut lumber pieces. For example: (2) pieces of 1″ Canadian Birch 18″ x 18″ and (3) pieces of 1/2″ Canadian Birch 36″ x 42″. When can I pickup my custom cut pieces? Once your order is confirmed, we will add it to the cutting cue. Lead times vary, but we will always give you a timeline for your order and call you as soon as it is ready for pickup. Or, better yet…do you deliver? Yes we do! We have a brand new cargo van for fast delivery Monday – Friday. Our flatbed truck is also available for larger orders. Simply request delivery when you submit your order via the Contact Us page and we will include delivery times and pricing with your quote. It depends. For stock materials, usually within a couple of hours. We don’t want you standing around on the job site now do we! Custom cutting orders will take longer, depending on the quantity, but we do our best to get them out the next day. 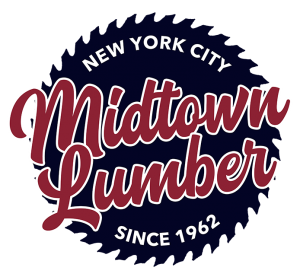 Do you cut wood that was not purchased from Midtown Lumber? Yes we do! As long as we determine that it is safe for us to cut. Price is based on exactly what we will be cutting, so feel free to stop by with your materials and we will see what we can do. Do I have to purchase full sheets of material, or can I just buy the pieces that I want? At Midtown Lumber, you have the choice to purchase full sheets or pieces. Certain materials are only sold by the sheet. Please call us for more information. We cut lumber to exact size, and have highly experienced team members onsite.